SEAN: If I’m being honest, I’m most excited this week about 10 Dance and Skip Beat!. But I’ll throw my pick behind Everyone’s Getting Married, a final volume, because I love Viz’s “Josei Beat” titles and wish they could get more of them. MICHELLE: I’m also most excited for 10 Dance and Skip Beat!! As much as I love the latter, however, I’ve been extolling its virtues on a biannual basis for quite a while now, so I’ll award 10 Dance official pick status this time. ANNA: I love Skip Beat! so much, but I’m also going to pick Everyone’s Getting Married. I hope the ending of this series means we get another “Josei Beat” license announcement soon. 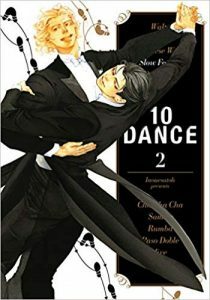 ASH: Like most everyone else so far, 10 Dance is definitely one of the manga that I’m looking forward to the most this week. The other series actually hasn’t been mentioned yet—Mob Psycho 100. The first volume’s mix of quirky humor and heart makes the series my official pick.